"What i want to ask all you guys that do internal arts is this. Lets say I practiced shotokan kata like Kanku Dai, Jion, Heian etc. etc. just as slow as a tai chi practicioner practices tai chi, let's say that I breathe in for blocks and out for strikes, all movement is slomo, there is no kime or any sort of tension the whole body is relaxed. Would this have the same health benefits to the body as tai chi does? Well, that's a fascinating question. It reminds me of this video on Youtube of a karate kata in relation to which a viewer commented: "It looks like taichi". I answered: "No it doesn't." 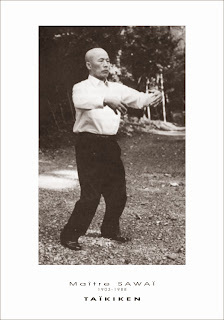 USA Goju "Mawashi uke kata" done "slowly" - but it is nothing like taijiquan! No - karate done slowly is not like taijiquan. The reason comes down to design, specifically in relation to the connectivity of movements. First you should take note of what I call the "weight transfer" principle: when you perform taiji your weight is constantly shifting from one foot to the other; forwards into a blow, and backwards when you are evading. It is often said that taiji is never "double weighted" (ie. as per the horse stance) however this is a bit of a misnomer. In fact, in taiji as in any martial art, as you transfer your weight from one foot to the other, your body will necessarily pass a mid-point where your weight is evenly distributed (albeit briefly) over both feet. The point remains however that taiji tries to minimize the time during which one is "double weighted". The weight transfer principle is, to the extent possible, applied to every movement; there is very little time where you are not in the process of transferring weight directly into a technique. Put another way, taiji minimizes "dead" time - something I'll elaborate on in a moment. This is quite different to karate or most "external" arts of China. Consider heian shodan / pinan nidan after your first punch as an example (see the pictures on the left). 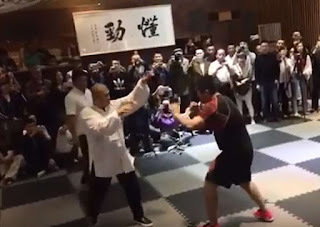 You have stepped into a deep zenkutsu (common to taiji) and punched with your leading arm (nothing different here per se although taiji prefers reverse counters). What is significant is that in taiji your next move would tie your weight transfer backwards with a technique (say a deflection). This deflection would happen before your leg crosses the mid line of your body and become part of that movement. Heian shodan does not do this however. It makes you shoot your leg behind you, lets your bodyweight transfer over the mid-line of your body and only then do you start to apply a downward deflection. 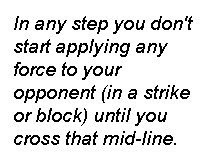 In any step you don't start applying any force to your opponent (in a strike or block) until you cross that mid-line. I call the period before you pass the mid-line in any step "dead" time. The 3 main internal arts of China put a premium on avoiding this "dead" time or at least minimizing it. They each approach this task in very different ways. I demonstrate how goju ryu might look if it applied xingyi weight transfer concepts. In taiji the minimization of "dead" time is done through maintaining a fluid and contextually relevant transfer of weight at all times. This means that unlike xingyi, taiji flows. Note how after the first strike your weight shifts back to do a chest deflection, and only then do you move your momentum forward into your opponent with another (low) deflection and a reverse counter. Even though you move over your mid-line, you do so as part of the application of a technique or otherwise contextually so that the "dead" time is not going to be utilized by your opponent. In the case of brush knee, your "dead" time is absorbed into the chest deflection. Put another way, you use the process of the deflection as an opportunity to move towards the mid-line. Moreover your "dead" time also occurs when your opponent (who has been deflected at full extension) is withdrawing. You move with him across the mid-line and load for a second deflection - this time a downward block. By the time you perform the downward deflection and counter (they flow into one another) you are, once again, using your full body weight. This kind of design permits a state of constant movement. Again, compare this with the 3 forward steps in heian shodan and I'm sure you agree that without some serious redesigning, it cannot be done continuously in the same way. Doing it slowly will be... slow karate - not taiji. So in short, taiji is designed for continuous flowing movement - one movement feeding straight into another with as little "dead" time as possible. On this note, taij is calming/meditative precisely because you feel like you are in free-fall; the constant movement actually makes you feel like you are floating or flying. It is a hard feeling to capture; it takes years to have that level of control and skill, and even now I have times where I find it hard to capture the right feeling with certain movements. This feeling comes out of both the design and one's ability to control one's core muscles (the little stabilizing ones) that enable such precise, slow weight transfer. It is possible to do karate techniques in a slow taiji way. 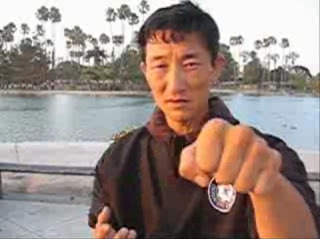 It is possible to do karate techniques in a xingyi way or a bagua way. However the katas themselves are not designed with this "way" in mind. You would have to redesign the kata substantially in order to make, say, Jion, be "like taiji". In my experience if you try to modify a karate kata along internal arts lines you end up "building a new beast". 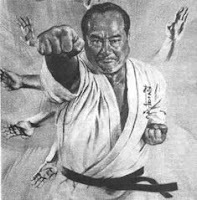 This is usually a pointless endeavour as many of the bunkai of karate kata would necessarily be lost in any attempt to make them "taiji like" or "xingyi like" or "bagua like". I am no stranger to designing forms, as you know. My own "nagegata" forms were designed using stray projections or throws taught to me by my teacher after his trips to Taiwan. 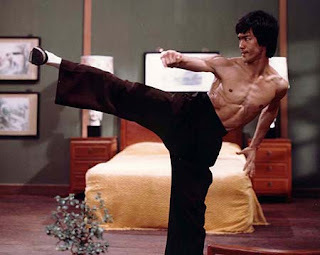 I have put them together utilizing taiji, xingyi and bagua concepts for the weight transfer, but often using karate stances and hand movements (because of my familiarity with them - eg. hiki/kake uke from goju). My nagegata sho or touxing chu form. Note the flow and taiji-like weight transfer principles being employed. The first nagegata form which features taiji like weight transfer - note the flow. It is possible to perform this kata slowly like taiji if you wanted to (it isn't quite as nice a feeling though - it simply isn't designed to be taiji despite its "flow" aspect!). My nagegata dai or touxing da form. Note the mixture of internal arts weight transfer principles being employed. 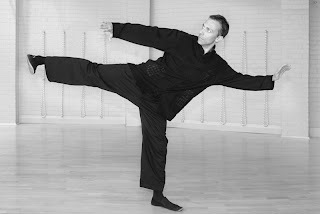 The second nagegata form which features xingyi, bagua and taiji weight transfer principles; note at around 0:13, 0:15 and 0:26 the fact that the front foot shifts forward to exert immediate force on the opponent and allow the step through with minimal "dead" time. Note from 0:16 to 0:20 how I have connected the techniques so that they follow the natural steps absorbing the "dead" time contextually. These forms are really a product of my own karate background as well as my internal arts studies. Importantly they are not an attempt to create something new. Rather, they are my attempt to "package" techniques that have internal arts leanings. The are also not an attempt to "internalise" karate. One can indulge in little exercises as I have in the context of experimenting and exploring, but the karate kata themselves work well enough and don't require any "internalisation". Karate does not focus so heavily on weight transfer and other things that are focal points in the internal arts. Its pedagogy is quite different and if you mess with it you will invariably lose important applications as I have stated above. 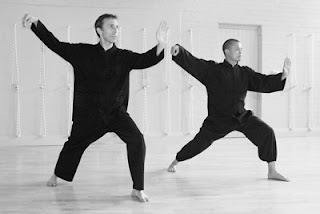 So in the end there is a lot more to taijiquan than moving slowly. Rather it is characterised by the fact that it has been designed for flow. When done slowly taiji helps you develop and strengthen the many small, core, stablilising muscles that are used in the context of this flow. Karate and other external arts can be done slowly, but they will not be remotely the same in feel, function or goal. That said, what about health benefits? 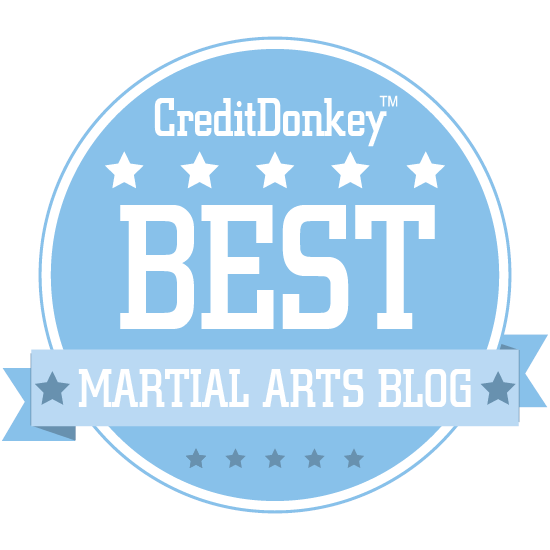 I believe any martial art performed correctly is good for your health. 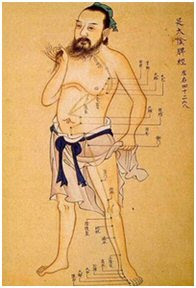 I don't subscribe to the Eastern paradigm of qi meridians etc. so I don't think there are any specific "internal" health benefits to taiji practise. Where taiji comes into its own is in its slow transfer of weight which strengthens your core stabilising muscles. It also puts you through a very thorough range of motion (including very low postures) which can keep you supple - all in the context of very low impact movement. The slow speed also decreases chances of injury. However taiji does not have any particular monopoly in this regard; the same can be said of any activity. While arts like karate tend to be practised in a more contact-oriented environment, there is no reason why they should be. Furthermore, a bit of sweat is good for you. For me taiji's principal health benefit is in its meditative quality; maintaining the correct technique and the "free-fall" feeling requires a great degree of concentration that puts your brain into an alpha-wave state. Accordingly taiji seems uniquely suited to the purpose of "moving mediation". However others might disagree on this point; it is, after all, a matter of personal preference. I've done a little bit of both karate and taiji, and I agree completely with your assertion that karate done slowly does not become taiji. You've covered in great detail the mechanical differences between them, and these are fundamental. However, you never addressed the actual question that you quoted: "Would this have the same health benefits to the body as tai chi does?" I claim that karate, done correctly, could have at least most of the same health benefits as taiji. In my (admittedly uninformed) opinion, these benefits come mostly from the zero-impact aerobic exercise, meditative state, and deep breathing of taiji. All of these could be replicated in a karate form without destroying the spirit of the form. 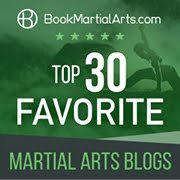 A karate form will probably never give you all the fine muscular control that you can get from taiji, but I suspect that you could get the vast majority of it if you trained enough - it's just that nobody trains karate this way for hundreds or thousands of hours the way that folks train taiji. Karate can be very healthy for you in term so of low impact work, meditation and so on. 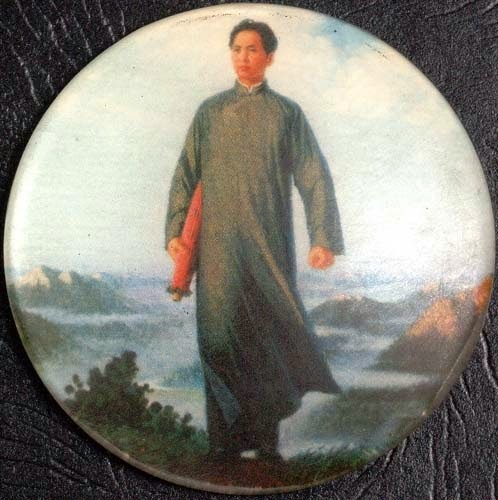 I am a karateka myself, so saying that karate isn't like taijiquan shouldn't be confused as a criticism. Karate is definitely not taiji. 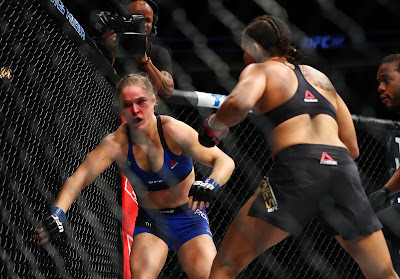 But there are movements in many of the Chinese internal martial arts that are useful to the cagey karateca. There are also underlying principle of movement that, as you imply, one can "indulge" in for experimentation's sake. For example, the chen taiji I practiced, although for a short while, did open up my view of kata. But I agree that the approach to movement and deflection are distinct and should not be confused by the slowing down or the speeding up, as the case may be. For an old karateca like me, the "internal arts" are a mysterious galaxy that I glimpse from afar. Yet, I do watch your "indulgences" closely, for whatever I can understand...and rob. An excellent delineation of taiji and karate.